Since Schluter-TROBA-PLUS stilts the mortar bed by 5/16″ (8 mm) over the entire waterproofing surface, irregularities in the waterproofing layer that could lead to the collection of water, such as uneven sections or elevations at the seams, are effectively bridged. Major defects in the slope of the waterproofing layer should be corrected prior to laying Schluter-TROBA-PLUS by applying an appropriate mortar. The open area between the studs and the fabric also creates an insulated air space that protects the waterproofing membrane against harmful thermal stress. Moreover, the insulated air space provides an effective sound barrier. The load-bearing substrate and waterproofing membrane must be adequately sloped toward, and connected to, the designated drainage exit. Prior to laying the Schluter-TROBA-PLUS, any severe defects in the waterproofed slope must be corrected using an appropriate mortar. Irrespective of slope, Schluter-TROBA-PLUS is loosely laid over the waterproofing membrane (filter fabric side up). Adjoin sections of Schluter-TROBA-PLUS by abutting the edges and overlapping the filter fabric. 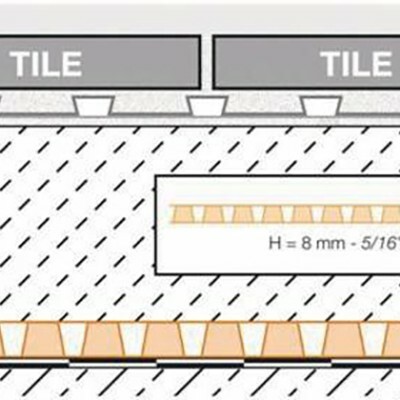 The surface covering assembly is installed directly over the Schluter-TROBA-PLUS according to current industry standards. 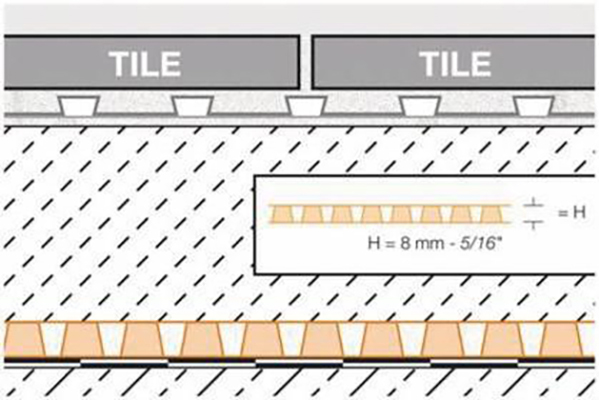 If tile is to be installed using the Schluter-DITRA system, please refer to the Schluter-DITRA Installation Handbook for complete installation instructions and warranty criteria. 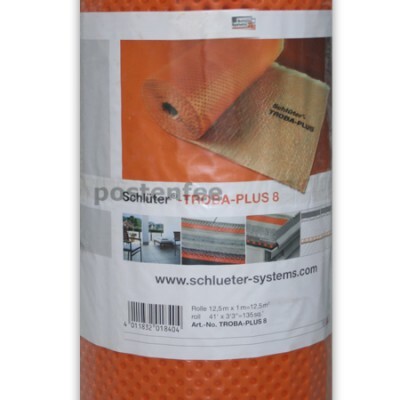 Schluter-TROBA-PLUS consists of a pressure-stable polyethylene sheet with unilaterally positioned studs and a polypropylene filter fabric bonded to the studs. The material maintains its shape up to a temperature of +176 °F (80 °C). 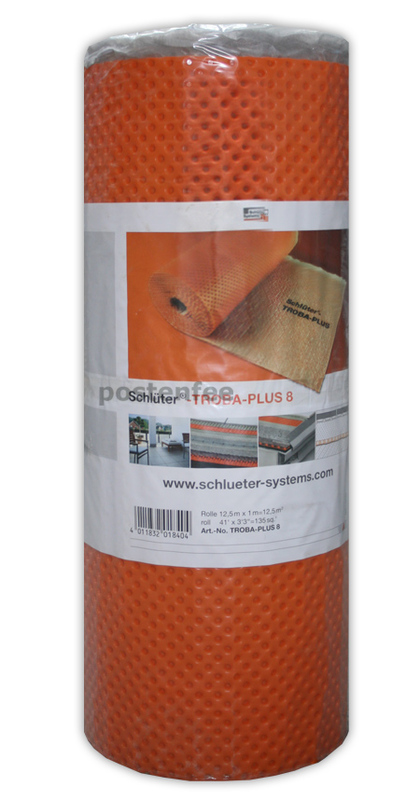 Schluter-TROBA-PLUS has a compressive strength of 8,000 lb/ft2 (39 t/m2). 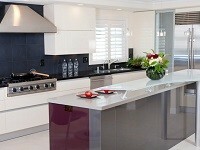 Its functional and material characteristics are permanently guaranteed. 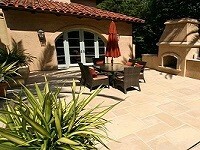 The material is resistant to aging and will not rot. Schluter-TROBA-PLUS requires no special disposal. 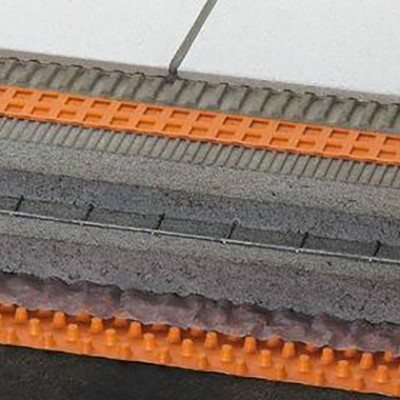 Schluter-TROBA-PLUS is used primarily in horizontal applications over sloped waterproofing layers. 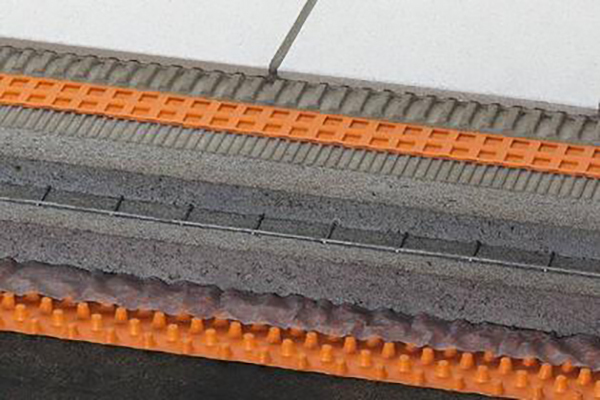 TROBA-PLUS provides an effective drainage layer between the waterproofing layer and the covering assembly above. This system is generally used on balconies and terraces, but its applications also include industrial structures, swimming pool decks, washrooms, showers, etc. (all of which have been waterproofed). The loosely placed Schluter-TROBA-PLUS is adequately resistant to mechanical stresses incurred during the installation process; i.e., due to foot traffic and wheelbarrows. The load-distribution layer may consist of a mortar bed with or without a tile covering, or it may be constructed of crushed stone or gravel with a paver or stone covering. It is also possible to apply a covering of soil. Any water that penetrates the covering is collected in the stilted drainage area of Schluter-TROBA-PLUS where it runs off, under normal gravitational force, toward the designated drainage exit. Thus, permanent saturation of the load-distribution layer, due to seepage water, is eliminated.